Omnilux is a new technology based on narrowband Light emitting Diodes (LEDs). Their range of products includes Omnilux blue™, Omnilux revive2™, and Omnilux plus™, for treating a wide range of dermatological conditions including acne and wrinkle reduction. 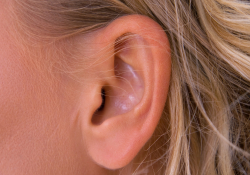 The auricle (outside) of the ear is composed entirely of soft tissue. The more rigid areas consist of only skin covering cartilage with a minor amount of connective tissue between the two, while the ear lobe itself is just a fatty tissue deposit at the bottom of the auricle. These are fragile structures that are very susceptible to damage, especially after being pierced; large and heavy pieces of ear jewelry will only exacerbate the weakness of the ear lobe. Luckily, because there is no cartilage in the actual ear lobes, they can generally be repaired with successful results and minimal risk of deformity. Ear piercings should only be performed by a properly trained and licensed person using a new, sterile needle. Having the ears pierced is a very common procedure, but poor after-care can lead to infections that may have permanent effects on the health and appearance of the ears. The most important part of caring for newly pierced ears is keeping the piercing clean. The ear lobe can become infected if the area is exposed to bacteria. Hyperhidrosis is a condition that causes excessive sweating on the hands, feet, and armpits. The exact cause of this condition is unknown, although it often runs in families and begins during childhood. 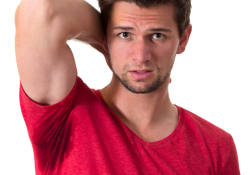 Patients with hyperhidrosis may sweat all over their body or in certain areas. Their skin may become white and wrinkled or red and irritated as a result of the constant moisture, and it may develop an odor as well. Living with hyperhidrosis often causes patients to feel embarrassed, awkward and self-conscious, especially during social situations. Treatment for hyperhidrosis depends on the severity of the condition, but may include prescription-strength antiperspirant or medication to help control sweating or stop the stimulation of the sweat glands. Botox® injections in the armpits block the nerves that cause sweating and can effectively treat hyperhidrosis for up to six months after injections. PRP (Platelet Rich Plasma) is an exciting new non-surgical option for women and men who require stimulation of hair growth to treat thinning hair. PRP is your blood plasma that has been enriched with platelets. Platelets contain numerous growth factors to help stimulate collagen and tissue regeneration. Highly concentrated growth factors in platelets have been shown to generate new hair growth and improve thinned out hair. The process of PRP therapy consists of drawing one small tube of your blood in our office just like a routine blood test. The blood is then spun in a centrifuge. The blood draw takes just a couple of minutes. The portion of the blood containing a higher concentration of platelets and growth factors is separated and collected. This is then injected into the scalp. There may be some temporary discomfort or possible redness and inflammation at the application site, but this quickly resolves. The primary purpose of using PRP in hair restoration is to stimulate inactive follicles into an active growth phase. This cutting-edge preventative and corrective therapy harnesses the body’s natural healing process. The autologous Platelet Rich Plasma (PRP) is produced from a patient’s own blood and has been safely used to promote tissue healing in sports and other injuries.